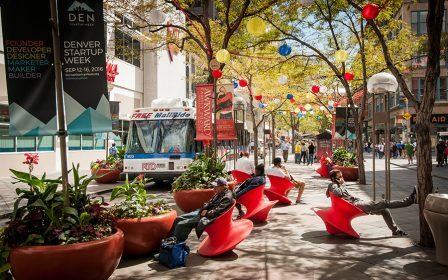 On Jan. 24, 16th Street Mall partners recommended a design for reconstruction of the 16th Street Mall that would expand sidewalks for walking, café seating and other activities, and move transit lanes to the center or offset-center of each block. These updates are designed to enhance the Mall experience for visitors while improving pedestrian safety and mobility on the city’s most transit-rich street. Noon – 1 p.m. or 5 – 6 p.m. Note: The public will have an opportunity to provide input on additional amenities and design features, and learn about construction activities, at an additional public hearing tentatively planned for May 2018. These updates are designed to enhance the Mall experience for visitors while improving pedestrian safety and mobility on the city’s most transit-rich street.